Item # 312246 Stash Points: 2,195 (?) This is the number of points you get in The Zumiez Stash for purchasing this item. Stash points are redeemable for exclusive rewards only available to Zumiez Stash members. To redeem your points check out the rewards catalog on thestash.zumiez.com. Give your pad an abstract skate inspired look with the Society6 Die When You're Dead Banner. This extremely large piece of wall decor features the image of a skeleton skateboarder melting into multicolor designs with accompanying text that reads "die when you're dead". 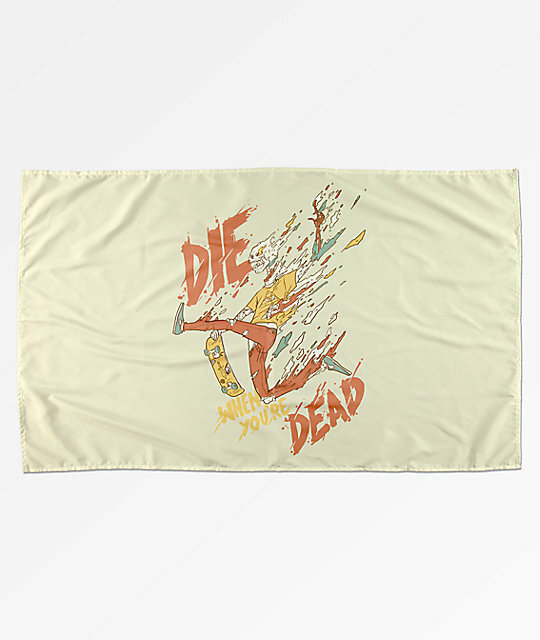 Die When You're Dead Banner from Society6. Large skeleton skateboarder melting into multicolor designs with text that reads "die when you're dead". 29" x 46" |91 x 60 cm approx.